NOTE: Members of the general public with questions about background checks, firearms transactions or tips about possible criminal activity should contact (615) 744-4000 or visit http://www.tn.gov/tbi. Josh joined the TBI after a career in television news, which included stops in Clarksburg, West Virginia (near his hometown) and Flint, Michigan. In 2009, Josh landed in Nashville, where he worked for more than five years as a Reporter at the NBC affiliate. During his time there, Josh earned Emmy awards for his coverage of the murder of former Tennessee Titan Steve McNair, along with the historic 2010 floods in Middle Tennessee. Josh holds a Bachelor of Arts degree in Religion and Communication from Denison University in Granville, Ohio. He also holds a Master of Science in Journalism from Northwestern University in Evanston, Illinois. In his spare time, Josh and his wife, Lauren, enjoy Nashville’s coffee and food scene, along with distance running. Josh completed his first marathon in 2009. 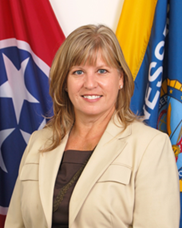 Susan joined the TBI after nine years as Communications Director for the Davidson County District Attorney General. A native of Indiana, she also worked in television news for several years, as a reporter, anchor, producer, and photographer in Lafayette, IN, Greenville, MS, and Jackson, MS, before coming to Tennessee and working in Knoxville, Memphis, and Nashville. While in Nashville, Susan earned an Emmy award for work on an investigation into the Feed the Children charity. During her time at Nashville’s CBS affiliate, Susan attended law school at night and graduated and passed the bar in 2001. Outside of work, Susan enjoys travel and local music concerts, but her main passion is fostering homeless dogs for a local rescue organization. Leslie joined the TBI’s Public Information Office in July 2016 after serving five years as a Deputy and Public Information Officer for the Sullivan County Sheriff’s Office. She graduated from the Tennessee Law Enforcement Training Academy in 2011. Based in Johnson City, Leslie handles media and public affairs for the 21 counties in TBI’s Upper East region. Prior to her law enforcement career, Leslie worked as a reporter at the NBC affiliate in Bristol, Virginia. Leslie holds a Bachelor of Science degree in Mass Communications from East Tennessee State University. In her spare time, Leslie enjoys traveling with her husband Will. She also loves hiking and spending time with her two dogs. Leslie also volunteers for the SBK Animal Center in an effort to increase adoption rates and inform the public about issues surrounding homeless animals in the Tri-Cities region.